I’ll admit I’m a massive fan of the original Resident Evil 2. I played the game numerous times in my past, completing all four main scenarios and the Hunk scenario as well. I even read the S. D. Perry novelization of it because I enjoyed the game so much. The first four Resident Evil games, 1, 2, 3 and Resident Evil: Code Veronica were solid games that I loved despite the bad controls. 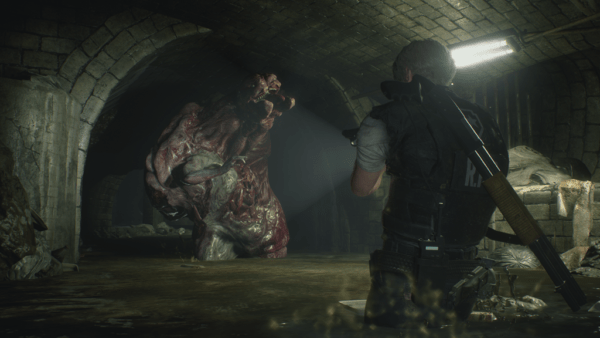 The modern reboot of Resident Evil did fine and eventually received an HD remaster. 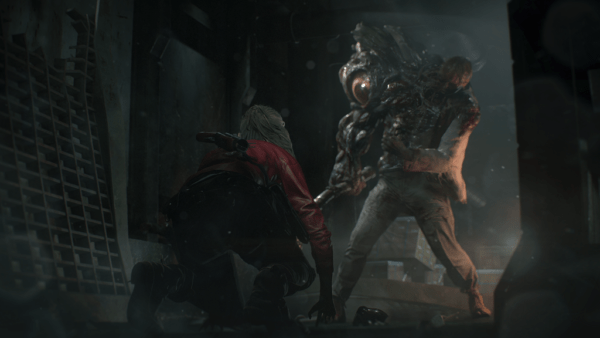 However, with Resident Evil 2 Capcom went the full remake route. I’m glad they did as it’s one of the best experiences I’ve had in a long time. The most obvious change in this game from the original one is the perspective change. Gone are the days of the fixed camera angles and tank controls. 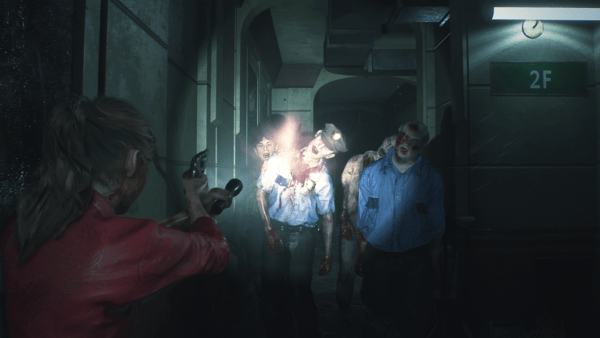 Instead, RE2 now uses a 3D camera with modern controls. In fact, controls are actually pretty simple and handle really well. Using a gamepad, LT is used to get into your shooting stance with RT doing the actual shooting. If you hold LB you enter the same stance but you use your sub-weapon instead. X reloads, while A is the “interact” button. Holding down and pressing B helps the character do a 180 quick turn. RB changes weapon ammo if you have a weapon that has it. Y opens your inventory, and select is your map. The camera is slightly akin to the one pioneered in Resident Evil 4. However, it’s not the exact same thing, that camera was more action-focused and slightly pulled out. Here it is pulled in closer to make RE2 a more claustrophobic experience. If you’ve played the original RE2 game the story is basically 95% the same. 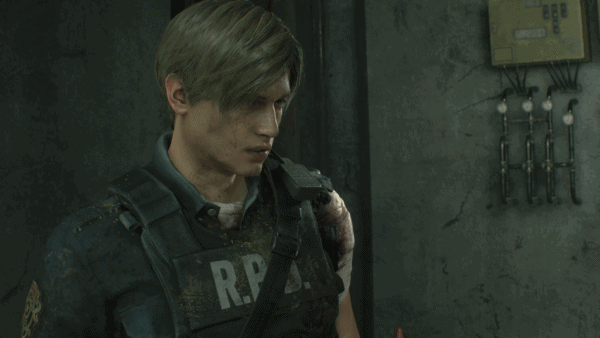 For the uninitiated, the basic premise is that you can play as either Leon S. Kennedy– a newly arrived rookie cop to the police department or Claire Redfield who is trying to find her brother Chris (a character from the first game). 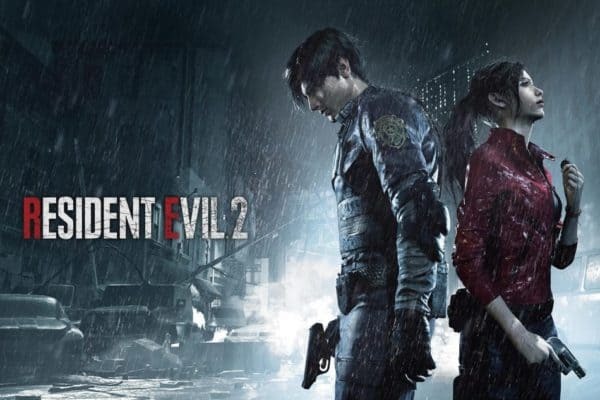 Both characters get to Raccoon City at the same time only to discover that people are zombies, the town is in ruins and now both characters are just trying to escape with their lives. Zombies are the enemies you encounter through most of the game. You can down them with a few shots but remember to aim for the head if you can. Just because a zombie goes down doesn’t necessarily mean they’re dead (again). Occasionally, they can come back for a surprise attack so be mindful of that. There are other enemies like mutated dogs, blind (but super-hearing) Lickers, plant zombies and so on. But they pale in comparison to Mr. X.
Mr. X is basically the Nemesis type character in the game. While he was in the original RE2 he was annoying to deal with but manageable, in this version it’s a whole different ballpark. 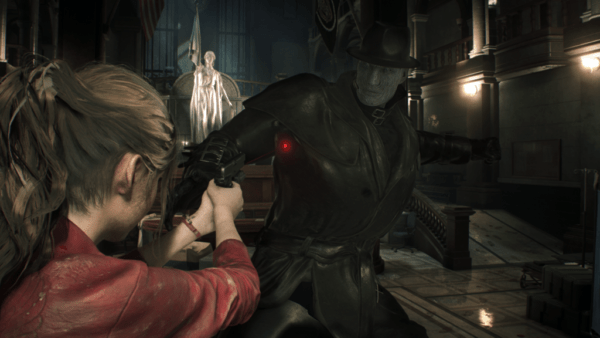 Mr. X is an enemy that chases you around the police station, is fast, strong, can follow you through most doors and is incredibly tough. He shrugs off most weapons but eventually goes down if you pelt him with enough shots. There are some areas of the police station where he won’t go through, so this can be somewhat of a refuge. However, you’ll always be on heightened alert once you hear his heavy footsteps. Fortunately, he only appears about one-third through the actual game and is only really a threat in the police station, despite showing up later on as well. A system that has carried over from the old game is the Zapper system, though it’s been slightly redesigned. When you start the game you’re told to pick a character, either Leon or Claire. Once you finish his or her quest, you are bounced back to the menu and offered the “Second Run” option. This lets you play through the other character’s story with a few small changes. It basically starts you off further ahead in the story and is a slightly more truncated version. 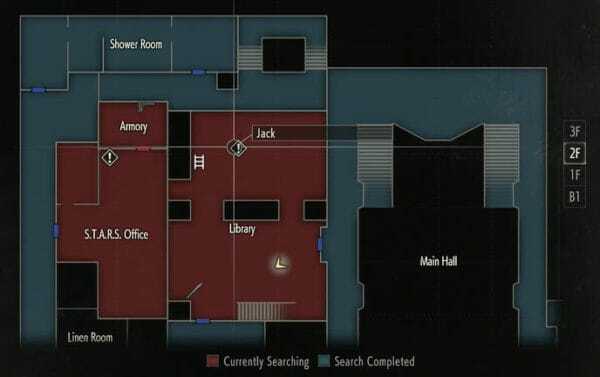 The general flow of the game sees you walk around the police station (or other locations) and finding new resources (ammo/healing items) while also spotting locked doors. You then have to find the keys or items to open those doors, which leads you to even more new items and doors the further you go. Eventually, you reach a point in the story where you change locations completely, going from the police station to the sewers and so on. There are also puzzles for you to solve. These almost always involve you finding objects strewn around the world but a few are somewhat more involved. One involves you finding chess pieces and putting them in the right slots while another involves mixing a chemical formula to kill a big plant. These puzzles are nice diversions and help break up the story so it’s not all just zombie killing. Two of the better changes are the map and inventory system compared to the old game. The map shows you your location, rooms you haven’t explored, rooms that still have items in them and rooms that have nothing of interest. It also shows you the location of locked rooms as well. So, say you found the Spade Key, your map shows you all the Spade Key locked doors you passed. Thus, allowing you to open them. Compared to the old game, the inventory system is vastly changed and improved. At the start of the game, you only have eight inventory slots to hold items. But as you play and unlock new rooms and hunt around, you’ll find hip pouches that add two inventory slots per pouch to your overall inventory. I’ve found up to four hip pouches in my playthroughs which doubles your starting inventory. Aside from the obvious camera/perspective change, I think the biggest change in combat is you now have a sub-weapon that you can have equipped. These are basically a knife, a hand grenade or a flash grenade. If you are grabbed by an enemy, you can quickly use the sub-weapon basically as an escape maneuver to avoid the damage and (many times) kill the enemy. The grenades will just explode but if you use the knife, you’ll stab the zombie or enemy attacking you. You can then pick up the knife after the fact but it will become damaged. You can also use your sub-weapon outside of an imminent threat and they become more useful, particularly the hand grenade. If you have multiple zombies after you, you can chuck a grenade at them and they will all likely go down. 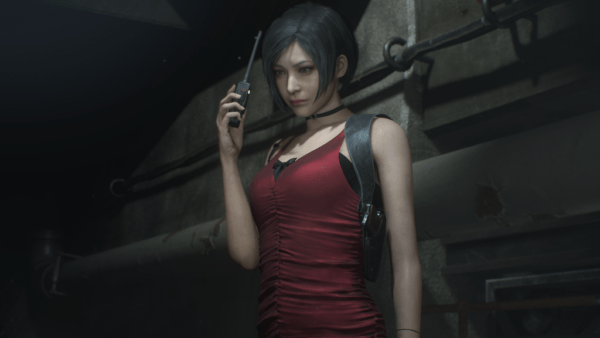 Leon and Claire are the two big playable characters in the game but you also play as Ada Wong and Sherry Birkin, with Ada being tied to Leon’s campaign and Sherry tied to Claire’s. Ada is fairly straight forward and more puzzle focused. She basically has a hacking gun and you have to reroute power lines in the walls to power on doors or fans while in the sewer. It’s not too long, maybe about 10 or 15 minutes if you really power through it, no pun intended. Sherry is a different matter. She is an 11 or 12-year-old girl and has no combat in her area. Your job is helping her escape an orphanage where Claire is being held, prisoner. Half of it is just trying to find your way around but the other half is a forced-stealth sequence which isn’t great to say the least. If you get spotted once it is a game over. 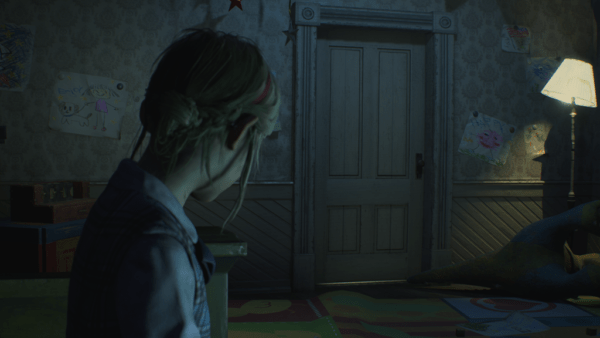 I occasionally died as I played the game as either Claire or Leon, getting cocky against a boss or just not having enough healing items in certain spots. However, nothing “killed” me more than this Sherry sequence. I think I died about eight or nine times, bearing in mind this is only like a 5-minute long thing. It is the single worst part of this package, at least to me, and the only thing that marred the experience. If not for the Sherry stuff, this would be a perfect game. Even with it, it is still a wonderfully impressive package. Capcom faithfully updated a game from 20 years ago and made it as current and fresh feeling as any recently released game. It is an extremely tense and scary atmosphere but one that is great to explore. If you’ve ever had any fondness for Resident Evil or horror games in general, this is an immediate purchase.